The Spectacular Bridge that Connects Denmark to Sweden « Adafruit Industries – Makers, hackers, artists, designers and engineers! The Øresund Bridge is an engineering marvel that connects the Danish capital Copenhagen with the Swedish city of Malmö. It is an 8-kilometer cable-stayed bridge and it results in an artificial island where it is converted into a tunnel with 4 kilometers length. The Øresund Bridge was designed by COWI Company based in Denmark and its main architect was George K.S. Rotne. 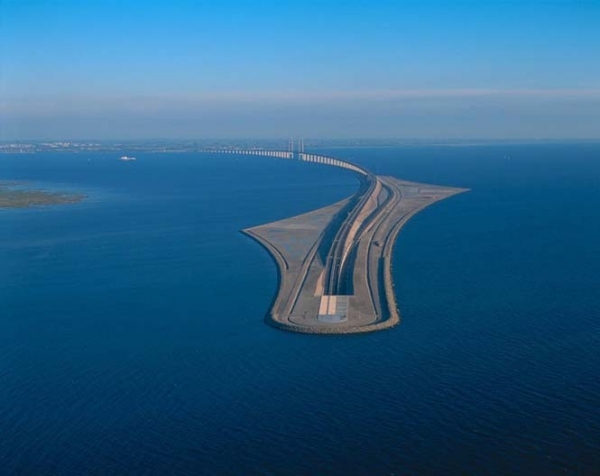 The bridge and the tunnel cross the Strait of Oresund and their cooperation is managed by the two countries. The cable-stayed bridge has two pillars of 204 meters supporting the bridge with a length of 490 meters above the Channel Flinte. The motorway is located on the upper level, while the railway passes underneath. Most of the pieces of the bridge were built ashore and taken to the point by large floating cranes. Only the pillars were constructed on the spot. The artificial island of Peberholm connects the bridge and the tunnel. The island is built from materials from the seabed and most of the 4-km long tunnel was constructed from concrete elements. Very cool..! There is a similar setup crossing Tokyo Bay. Check it out..!